A heavy and sturdy mostly metal built aperture-priority compact that takes 35mm film. A lever on the bottom opens a cover and releases the lens, which then pops forward. The 35mm f/2.8 lens has 2 control rings, front for adjusting focus by a distance scale, and second to select aperture. The camera measures light and sets shutter speed accordingly. A little button just above the viewfinder can be pushed to check for over or under exposure shown by a needle in the viewfinder. It does not inform about actual shutter speed, it just moves up and down. It's said that the camera has a max shutter speed of 1/1000sec. This is however not confirmed. ISO settings range from 25 to 500. The camera uses 2 LR44 batteries for the lightmeter and the electronic shutter. 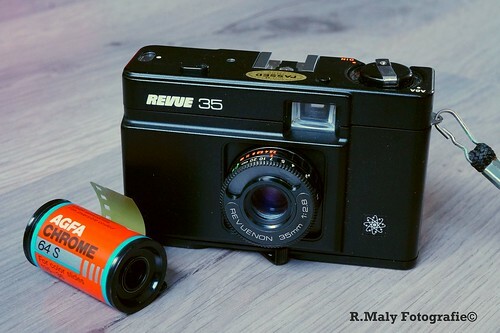 Revue rebranded this camera from a Japanese maker, it's the same as the Vivitar 35EM. This page was last edited on 6 March 2015, at 08:57.